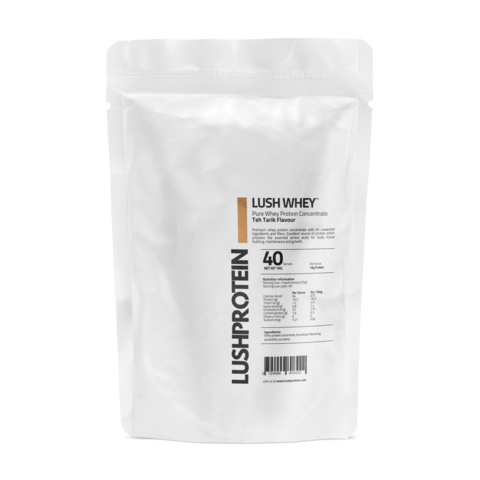 Lush Protein (Whey - 40 servings) – Strength Apparel Co.
What is Whey Protein 80 ? 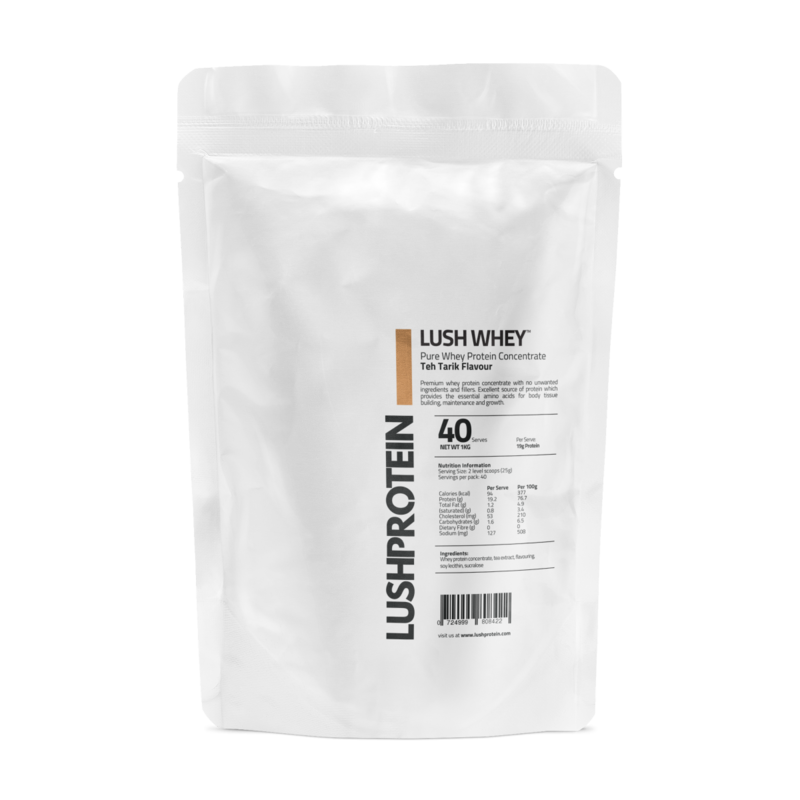 Pure, ultrafiltrated, cold processed and undenatured whey sourced from grass fed cows. Packed with 80% protein per serve, an excellent nutritional profile with no fillers or additives, excellent taste and unbeatable value - its no wonder our Whey Protein 80 is one of the best-selling pure whey protein powders on the market. Did we mention our protein has over 20% more BCAA (Branched Chain Amino Acids) than some leading brands? This is because while most (85%+) whey out in the market is produced as a byproduct of cheese making, our whey is derived directly from fresh milk, resulting in more leucine and higher PDCAAS (Protein Digestibility Corrected Amino Acid Score). Instantized to easily mix with a spoon. Our protein is deliciously drinkable on its own – and versatile enough to make your own shakes or cook with. Whey Protein 80 is gram for gram perhaps the best value source of protein out there. Buy in bulk and save! Sourced from some of the largest diary producers in Europe. 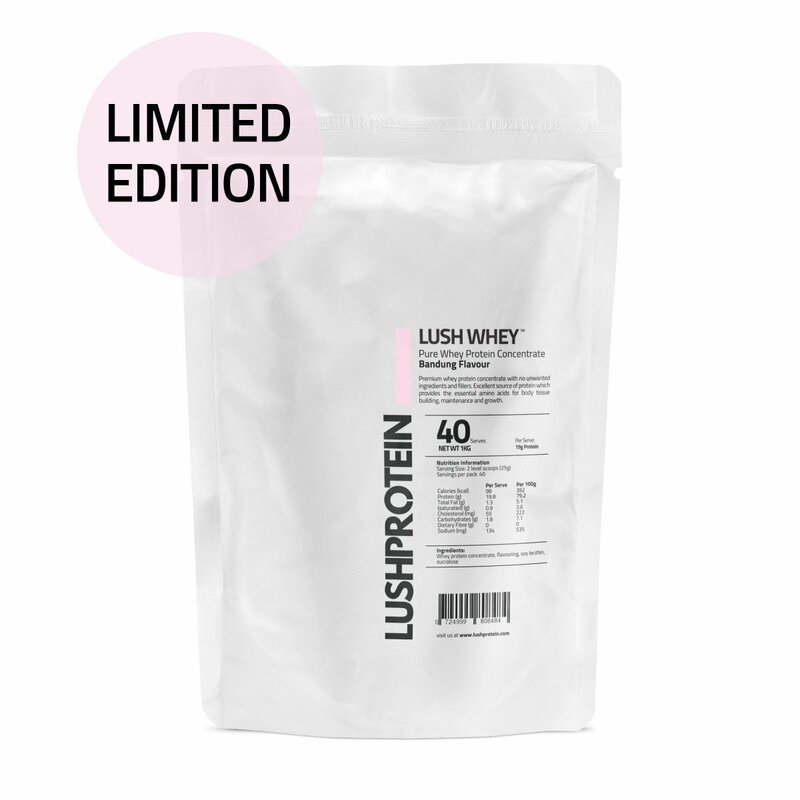 Our signature whey protein concentrate exquisitely blended with fragrant Japanese Matcha green tea powder. The nutritional benefits of Matcha Tea are well known – rich with antioxidants, energy boosting and fat burning properties. Compliment this with our signature Whey Protein Concentrate and you get a powerhouse workout shake! Every serve of our LushProtein MatchaWhey contains a standard serve of matcha powder which packs the potency of over 10 cups of brewed green tea. All matcha green tea contains a small amount of caffeine, typically about 1/3rd the amount of a cup of coffee per serve. Although unlike coffee, the caffeine in matcha tends to be released slower, over a gradual 6-8 hours. 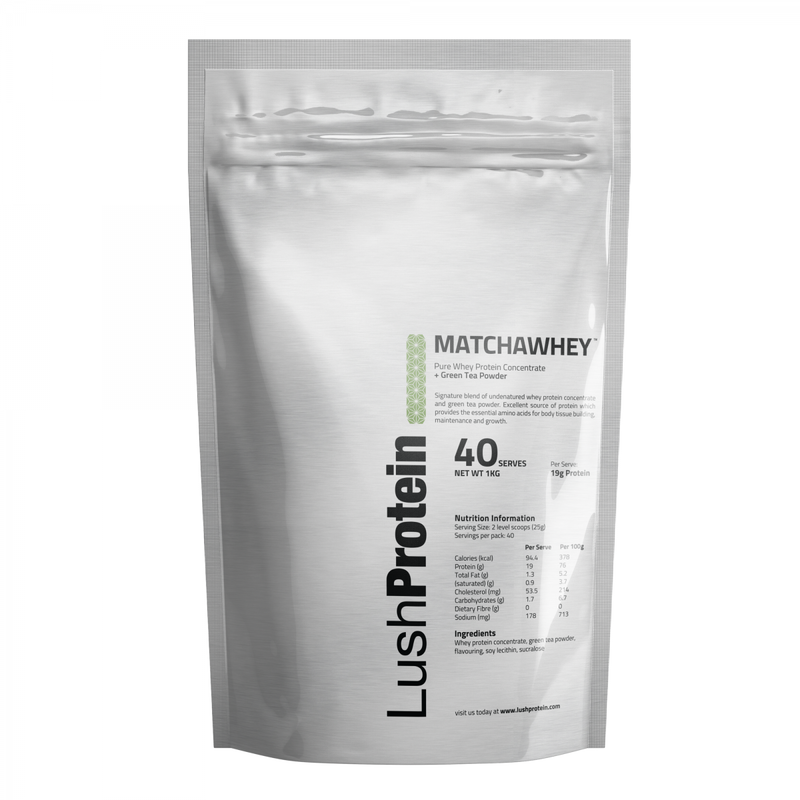 This energy boosting makes our MatchaWhey especially useful as a pre-workout shake, or even as a energy boost post workout. Like all our whey protein powders, ours is sourced from some of the largest dairy producers in Europe. Did we even mention ours has over 20% more BCAA (Branched Chain Amino Acids) than some leading brands? This is because while most (85%+) whey out in the market is produced as a byproduct of cheese making, our whey is derived directly from fresh milk, resulting in more leucine and higher PDCAAS (Protein Digestibility Corrected Amino Acid Score).No fillers, no stimulants and instantized to easily mix with a spoon. Drinkable on its own or versatile enough to make your own shakes or cook with. Q.Who should take / benefit from Whey Protein 80/MatchaWhey™? Q.What benefits can I expect from taking Whey Protein 80/MatchaWhey™? Q.When should I take LushProtein Whey Protein 80/MatchaWhey™? A.Depending on your lifestyle and goals, we recommend taking Whey Protein 80/MatchaWhey™ immediately upon waking up, 30 minutes pre workout, immediately after your workout and any other time during the day when you require additional protein intake. Q.How much Whey Protein 80/MatchaWhey™ should I take? Q.Why do I need to take Whey Protein 80/MatchaWhey™? Q.Are there any side effects from taking Whey Protein 80/MatchaWhey™? A.As with most foods, If you don’t burn the excess calories that come with the additional protein, it may lead to increased body fat. We have not heard of any side effects from taking Whey Protein 80/MatchaWhey™ other than maybe increased flatulence in some individuals! If you are allergic to dairy proteins, please consult your doctor prior to consuming any type of whey protein.